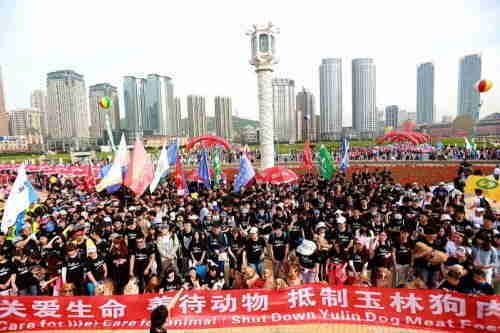 Recent news out of China suggesting that officials have "banned" the Yulin dog meat festival has understandably given campaigners cause for hope. However, this announcement is not what it appears to be, and the hundreds of thousands of dogs - and cats -suffering in Yulin and other Chinese animal markets still need our help. Between 10 and 20 million dogs per year are believed to be killed for consumption in China, with live dog and animal markets all over the region, as well as many illegal dog slaughterhouses. 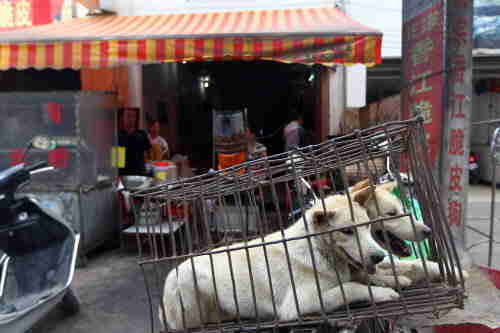 The killing of dogs for meat in the Chinese city of Yulin in the South Western Guangxi province has gained international notoriety for the sheer volume of dogs involved and the local trader's unashamed promotion of dog eating as a local tradition. 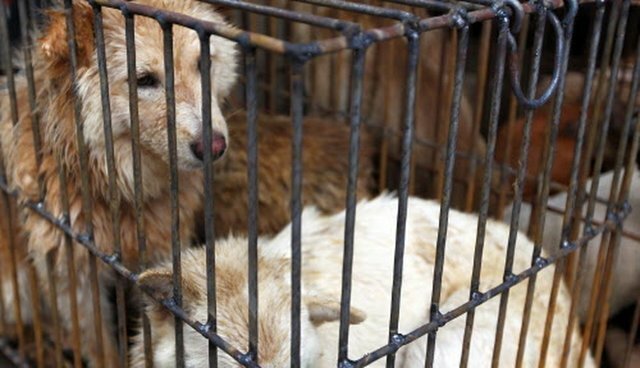 Taking place every year during the June summer solstice, Yulin has traditionally seen tens of thousands of dogs - many stolen pets still wearing their collars - crammed into wire cages, heaped on top of one another on trucks, and sent overland on grueling journeys. Many do not survive, dying of shock, starvation and dehydration. Those dogs who survive the transport - traumatized and terrified, barely alive and often injured from their transport - are then slaughtered in the street markets or in slaughterhouses. Humane Society International has been working to end this suffering in China for more than a decade, working with more than 35 local groups from 24 cities. 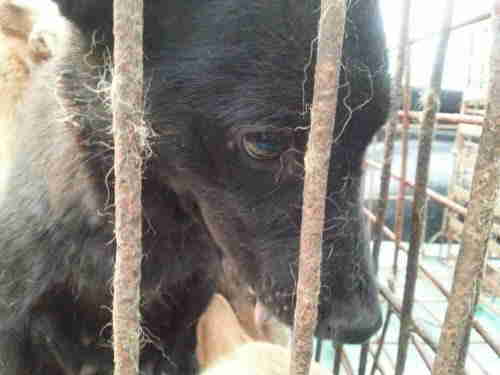 I have been to Yulin many times myself, and witnessed firsthand the heartbreaking trauma these dogs endure. We have assisted our partners in rescuing and adopting out thousands of dogs, and last year I even adopted a Yulin puppy myself. 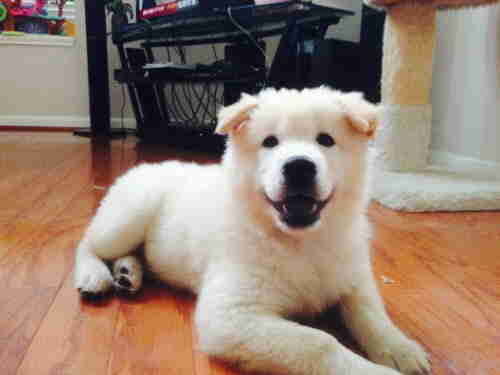 Colby, our fluffy white adorable family companion, is sleeping peacefully at my feet as I write this, hopefully Yulin now a distant memory for him. An end in sight for the Yulin festival? So what is the latest news from Yulin? A few days ago, party secretary Li Jun Qing of the Yulin Food Safety Office did indeed say the Yulin dog meat festival won't take place and that the government does not endorse it and will not allow it to happen. But this announcement was merely repeating what the Yulin authorities had previously declared last year, and while the number of dogs killed last year in Yulin was certainly reduced due to intense pressure, thousands of dogs still died for their meat. I have no doubt they will this year, too. The key to unravelling the meaning of this announcement is understanding the difference between the idea of a dog meat "festival" (which the authorities have refuted since 2013) and mass dog killing and dog meat consumption in Yulin. As far as the dogs are concerned, they amount to the same thing, but pronouncements by Chinese authorities are often a game of semantics, and this Yulin news is likely no different. Last year when Yulin authorities declared the festival was over, they summoned the dog meat traders about 20 days before the summer solstice, and warned them to remove the word "dog" from their restaurants and to slaughter dogs in the cover of darkness during the early hours instead of daylight, so that the controversy would simply be hidden from public view. The visible trappings of a festival disappeared, but so did thousands of dogs. The fact that the Yulin authorities feel the need to publicly deny involvement or endorsement of the dog eating event must be seen as a positive development, because it indicates a growing recognition that it is unpalatable, and that intense global as well as local protest is having an impact. The Yulin dog meat event has certainly been significantly reduced in recent years. It is likely that in a few months' time, mass dog meat consumption will once again take place in Yulin during the summer solstice, without being called a "festival." We will have to wait and see whether the volume of dogs transported in to the area to feed the mass consumption will still be allowed. At this stage this is by no means certain, and we are watching the unfolding situation carefully. Within China itself, there is growing and vocal opposition to the dog meat trade, particularly among younger Chinese citizens who are appalled this cruelty still takes place in their country. Earlier this year, a ban on dog (and cat) slaughter for meat was proposed in China, and nearly two million citizens expressed their support when asked by the official state ching.org.cn website used to assess public opinion. The ban proposal was delivered to the National People's Congress by the NPC deputy, Zheng Xiaohe, with the support of a reported 30 other NPC representatives. A formal reply is expected in the next few months. As I prepare to go to Yulin again this year, I have a heavy heart for the suffering that I will see, but also a renewed determination to end the dog meat trade once and for all. It is surely one of the worst betrayals of man's best friend and has no place in a compassionate society.